* Note : I have not used the applesauce substitute for the margarine in this recipe yet, but it should work fine like other baked goods. If you use it, let me know how it does, it could be a while before I have the time to test it. Preheat the oven to 350 F and prepare your muffin tray. Melt the margarine, if using, and set it aside. If you’re using applesauce as a replacement, heat it for 15- 30 seconds and set aside. Mix together the mashed bananas, yogurt and vanilla. Mix together the dry ingredients in a different bowl. Add in the berries and nuts and mix well. Add in the cooled margarine, or applesauce to the wet mixture. Add the wet ingredients to the dry and mix until just combined. Do not overmix, because overworked bananas could make the mixture gummy. 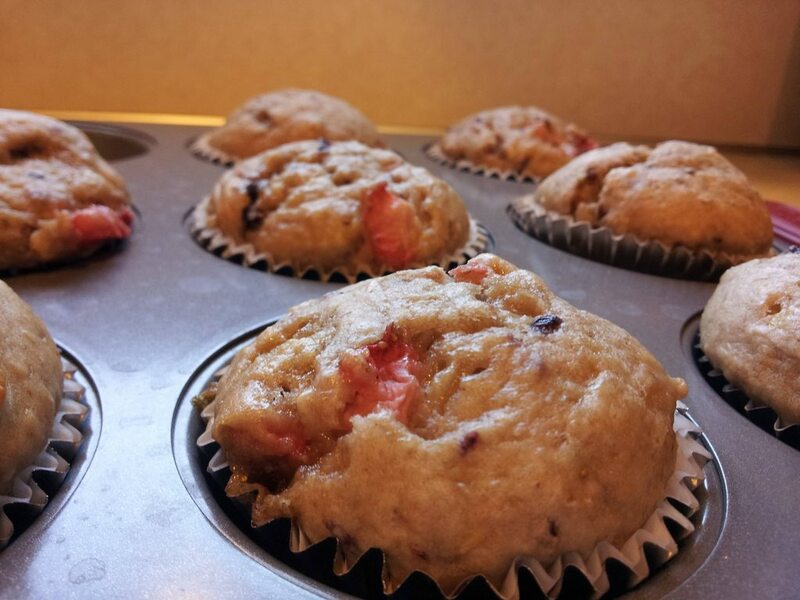 Fill muffin tins with a scoop of batter, about 3/4 the way full to account for rising. I got 12 muffins exactly. PS One more post, I also added 1/2 cup of almond milk as it was a little dry without the yogurt! Thanks so much for the clarification, I should have realized that…D-UH!